If you’re getting into Domain Flipping, you may be wondering if you can flip domains at domain forums? With so many places out there competing to help you flip domains, you may be wondering which the best places to offer your domain for sale are. You see, one of the best ways to sell domains is through domain forums. Those that sell domains through places like Digital Point usually find that they receive a good price for their domains. Most serious webmasters and domain flippers visit these types of places and are always on the lookout for those that sell domains. The vast member base of some domain forums, the specific interest of domain forum members, and the business-oriented nature of these forums make them a great place to sell domains. and Sedo. The users of these forums know what is good and what isn’t. Many are resellers and sell domains themselves on the same domain forum. Domain forums are very much alive and buzzing with activity. You should use this to get more exposure when you sell domains. Another key principle to note when you sell domains on forums is that you must have a good reputation. No one wants to buy a domain from someone who is not liked. A kind of informal protection is offered through the reputation system of domain forums. If you scammed people in the past, forget about it. Even if you aren’t scamming now, the past is going to catch up with you. Forum users have a way of protecting themselves, and if they notice anyone trying to scam with selling domains, they’ll make everyone aware of it. Keep all negativity possible out of your thread. If you frequently sell domains on a forum, have past buyers post a good word in your thread. Nothing says “great deal” like positive feedback from past domain forum users. Another thing to consider is that you can’t tell any white lies on a domain forum. The most experienced webmasters are on domain forums, and if there is any indication that you aren’t playing with your cards above the table, your sales thread will immediately fall through. Overall, domain forums are a great place to sell domains. But before you go ahead and sell domains on domain forums, always remember: Be careful with your words. Be kind, courteous, answer all questions no matter how stupid they may seem, and always attract positive attention to your thread. This is the formula to success for when you sell domains on a forum – if you follow it, you’re bound to profit. 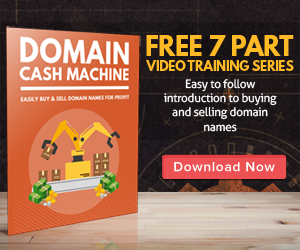 If you would like to learn how to build a six figure a year business with Domain Flipping, simply go to Domain Flipping.